Osama bin Laden was killed in May after a ten year manhunt by the US. 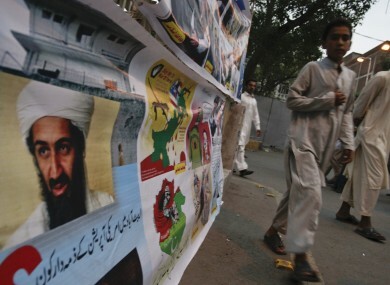 THE PAKISTANI DOCTOR who is alleged to have helped the CIA in its quest to track down Osama bin Laden has been accused of high treason in his home country. The Guardian reports that a Pakistani state commission has recommended that Dr Shakeel Afridi face the charges after he is alleged to have run the fake Hepatitis B vaccination scheme in the town of Abbottabad where bin Laden was eventually tracked down and killed by US forces in May. In July, it was revealed that in the months leading up to the killing the CIA organised a fake vaccination programme in Abbottabad in order to determine for definite whether or not bin Laden was hiding in the area as the organisation suspected from its surveillance operations. It was hoped that DNA taken from bin Laden’s children, who were based in the compound, could be matched with that taken from his sister who died in 2010. While it is not clear whether or not the plan worked, the CIA was later criticised by Médecins Sans Frontiéres which said the agency’s actions had threatened immunisation programmes worldwide. The doctor was arrested by Pakistani intelligence services for his co-operation with the agency and is now accused of high treason. Declan Walsh writes that four-man commission has concluded that there is “prima facie, a case of conspiracy against the state of Pakistan and high treason” should be made against Afridi. It is a move which is likely to heighten already fraught tensions between the US and its key allay in the region which reached a new low following the killing of bin Laden on Pakistani soil by US forces. The paper goes on to report that aid agencies working in Pakistan have been restricted in their work because authorities are wary of the possibility that some aid workers may be working on behalf of foreign intelligence agencies. Email “Doctor who 'helped CIA find bin Laden' accused of treason ”. Feedback on “Doctor who 'helped CIA find bin Laden' accused of treason ”.